Description: Glabrous, ± succulent perennial herbs or shrubs, decumbent to ascending, often mat-forming with ascending stems. Leaves usually alternate, often small and overlapping, commonly sessile. Flowers mostly 5-merous, arranged in small spreading cymes. 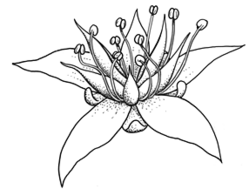 Sepals free or fused basally, sometimes spurred. Petals free or fused basally. Stamens twice as many as petals, in 1 or 2 whorls, hypogynous, shorter than petals. Carpels usually separate. Distribution and occurrence: World: c. 600 species, Europe & tropical America. Australia: 4 species (naturalized), N.S.W., Vic., Tas.